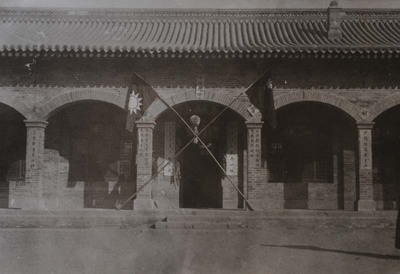 "Major seminary hall in honor of the Chinese martyrs"
Major seminary: inside the hall in honor of the Chinese martyrs beatified in 1900 and 1909; the picture on the wall represents these 21 Chinese martyrs; the couplet reads: 中 華 圣 較 之 光 榮，吾 儕 信 友 之 表 率 ([these martyrs are] the glory of the Holy Chinese Church [and] an example for us Christians). Major seminary hall in honor of the Chinese martyrs. Ca 1932. Société des Auxiliaires des Missions (SAM) China Photograph Collection, Whitworth University Library, Spokane.